Experience this wildly popular skin-soothing Dead Sea Amazing Minerals Face & Body Bar and treat your skin to something special! Naturally soothing and non-drying for itch-free skin, the Dead Sea minerals support clear, healthy skin without fragrances, colors or anything unnecessary. Lovingly hand-crafted and made only with pure olive oil, coconut oil, sustainably-sourced palm oil and Dead Sea minerals, you're getting a blend of amazing skin nourishing non-GMO ingredients with nothing unnecessary. 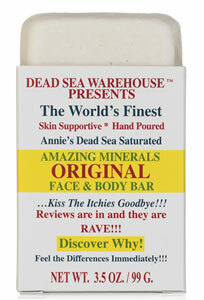 If your skin is dry, itchy, blotchy or just "not the way you wish it was", give this bar a try and experience the results for yourself! 3.5 oz. (99g) bars are $5.99 each.